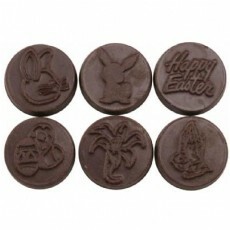 Get exciting coins with Easter shapes molded on them, like the Easter rabbit, the Easter egg or just a message saying Happy Easter. These treats, made with creamy Belgian chocolate, are available in 4 different flavors - milk, dark, dark mint and white. Have them wrapped in colored foil of your choice or get them packaged in cello bags tied with a ribbon of different colors.